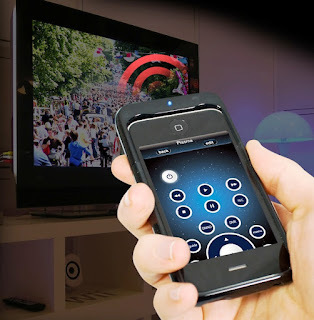 How to use the phone as TV and Set top box remote control. Easily manage all your devices with the help of your smartphone or tablet. Did you follow the latest home theater technology? Smart TVs, soundbars, DVD / Blu-ray players, HD set-top box and streaming players are some names of modern entertainment products. With all these wonderful gadgets come with remote controls. If you have all of them then there may be a pile of remote controls in your home. If you've encountered this problem, I've got good news there is an app for that, with the help of that you can use your phone as a remote control for various devices. In fact, there are some of them, you can choose best for yourself. Let us Consider two of the applications and domestic hubs you need to use. Blumoo Homebase Smart Control transforms your mobile devices into high-end remote controls that allow you to control the entire devices like Smart TVs, soundbars, DVD / Blu-ray players, HD set-top box and streaming players, find your programs and blumoo mobile to listen to your music through the application. It is easy to configure, just put Blumoo in the room, plug it in and load the application to start. Blumoo Homebase replaces all your remote controls with iOS or Android gadgets and supports multiple users. It also supports Amazon echo so you can control your devices with your voice. They have complete control over 250,000 brands and models of TVs, receivers, set-top boxes, streaming players, and more. What makes Blumoo better than the typical remote control? A Blumoo works with all iOS and Android gadgets. You do not have to aim your gadget on TV. You can control your devices from anywhere in your home. Configure your remote controls once and share it with someone in your home. Customize it as you think fit. Add/remove, rename and move. It allows you to stream music from your phone over Bluetooth to long-distance existing audio systems. The Logitech Harmony Ultimate Hub converts your iOS or Android phones into a universal remote. It allows you to control your entertainment devices at home and smart home mobile devices. You can even control your devices away from home. Anyone in the household will be able to download the free Harmony app in their phone to convert them into a personal universal remote control. You can control up to eight entertainment devices with your phone. It supports more than 270,000 devices such as TV, cable or satellite DVR, set top box, Blu-Ray players and more. The Harmony app works with many Harmony products as Harmony Hub, Pro Harmony, Harmony Elite and many others. Please share this information with everyone and keep visiting for more entertainment news and cool stuff.